Glamorgan head coach Toby Radford says it is frustrating to miss out on the knockout stages of the One-Day Cup because of a second points deduction. 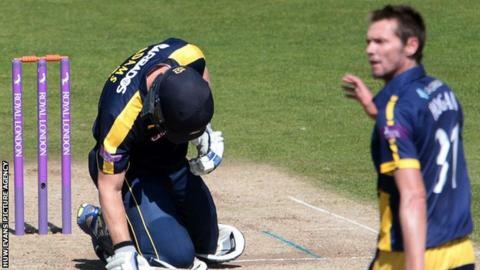 Glamorgan were docked two points for the dangerous pitch at the Swalec Stadium which saw the match against Hampshire abandoned. They lost their point from that game, having already been deducted two points for a poor pitch last year. "It's very frustrating and disappointing," said Radford. "I suppose we've been done twice [in two years] for the same strip of grass. "We were going quite well in the 50-over competitio,n but once you take five points off it's pretty much decimated us. "But that's the decision the ECB [England and Wales Cricket Board] have made and we've got to accept that." Glamorgan are now likely to make changes for the two remaining One-Day Cup matches away to Middlesex and Lancashire, in order to keep players fresh for the Lancashire County Championship clash at Old Trafford. Glamorgan are still waiting for the full results of a scientific analysis of the Swalec Stadium wicket which degenerated against Hampshire, less than 48 hours after being rated above average for the previous game. The club is not commenting on the results of its internal inquiry until it has full details of what caused the pitch problems. Glamorgan are left with just two points from their 50-over campaign so far despite having two wins and two washouts from their six games. "We've got to push on. We head up to Lord's on Monday which I think everyone's looking forward to, playing against Middlesex and then up to Lancashire on Wednesday," Radford told BBC Wales Sport. "The players have got to be positive. "It'll be an opportunity to bring in some younger players, give them opportunities and have a look at them at the back end of the season to see what we've got going forward for next year." Spinner Andrew Salter added; "As a group we're disappointed because losing five points is never good. "It's a competition we do play well in and we enjoy, so disappointing not to make it on the road to Lord's [for the final]. "[The group game against Middlesex] is probably not the road to Lord's we talk about, but it'll be awesome to play there. "Last time I've got fond memories of the final there [40-over in 2013]. It's a lovely place to play and the lunch there is awesome!" Meanwhile, Glamorgan have given a second-team run-out to South African Matthew Pillans, a 24-year-old fast bowler who has played first-class cricket for Dolphins and Northerns in his home country.